When the kids are in school it can be hard to get a warm meal on the table every night – and that’s where Michael Angelo’s comes in. 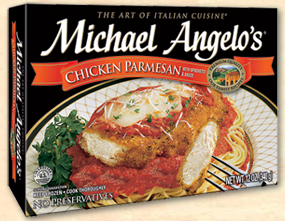 Michael Angelo’s Single Serve and Family Size Frozen meals are sold at Walmart stores nationwide (priced around $9.50) and the biggest appeal to me is that they are made from REAL ingredients. The 6 Family Serve Varieties include: Meat Lasagna, Eggplant Parmesan, Chicken Piccata, Vegetable Lasagna, Shrimp Scampi and Italian-Style Sausage and Meatballs. Check out the Store Locator for all the places you can find Michael Angelo’s. Michael Angelo’s does not begin preparing their meals until their customers (grocery stores) place their order. That means that the entrees are shipping to stores within 36 hours of being made – eliminating unnecessary time housed in a freezer warehouse. That means you are getting an extremely fresh frozen meal – which will be evident when you taste them! While I try my hardest to cook from scratch, it is not always possible. Having frozen meals from Michael Angelo’s helps prevent me from having to order takeout on nights when I am too tired (or unable) to cook due to our crazy schedule. Right now when you sign up for Michael Angelo’s Online Community, The Family Table you’ll receive a B1G1 Free Michael Angelo’s Coupon. This post sponsored by Michael Angelo’s as part of the Win Giveaways 2011 Back to School Giveaway Bash. This post was written by me and was not edited by the sponsor. Read more in my disclosure policy. Find more information on the terms for this giveaway on the Win Giveaways Facebook page. What a great giveaway! The Chicken Piccata would be the first one I would try. I have never tried them but they sure do look good especially the meat lasagna. Also like them thru facebook. Everything they have sounds really good but I think I’d like to try their Meat Lasagna. The four cheese lasagna sounds awesome! The Chicken Piccata looks yummy. Shrimp Scampi sounds sooooo good! I follow on twitter and twitted! I really like the natural vegetable lasagna ! All these meals sound delicious to me!!! yummy yummy yummy ready to put them in my tummayyy! The chicken or eggplant parmesan. I’d love to try the vegetable lasagne! Soccer season just started so we will need some quick meals on practice nights! Love the lasagna!!! Their food is so good, taste like homemade. Love u on FB and an email subscriber. I like you on Facebook, and I shared. What’s not to love about any Michael Angelo’s meal! I’ve never had the Eggplant, would love to try it. I would try the lasagna. I am also a facebook fan! I want to try the chicken parmesan! Their eggplant parmesan looks yummy! The vegetable lasagna sounds delicious! The eggplant parmesan sounds fantastic! The Vegetable Lasagna,yummy yum yum ! I subscribe to your emails . The lasagna is my favorite! The four cheese lasagna sounds yummy! I would love to try the chicken parm! I think with er the lasagna or the chicken parm would be really good!! I also receive your daily emails!!! I would love to try the Lasagna with Sausage! Italian Sausage and Meatballs both sound good! I just “liked” you on FB! I would love to try their Meat Lasagna…sounds yummy! The Chicken Canelloni sounds amazing! The veggie lasagana sounds yummy! I would love to try the Chicken Cannelloni! These all look soooo good! I have only tried the eggplant parmesan, but I want to try many others! I would love to try the Lasagna with Sausage. I follow StretchingaBuck on Facebook and shared about this giveaway on my page. I subscribed to your email updates! Thanks for hosting this and giving us the chance to win. The total value of just the dinners in this giveaway is more than my monthly grocery and paper goods allowance! I can only spend $80 per month, and that has to cover toilet paper, shampoo, bath soap…everything! This would be a real treat! I’ve had their eggplant parmeasan, and it was super yummy – I would have it again!! Shrimp scampi sounds excellent! Thanks for the opportunity! I am an email subcriber! I love the eggplant so much! The chicken piccata sounds yummy. I like the Shrimp Scampi. Thanks! I would like to try the Italian-Style Sausage and Meatballs. I like the meat lasagne. I’d love to try the veg lasagna! The Chicken Picatta and the Meat Lasagna sound great! Chicken Alfredo is something I don’t normally make at home and sounds delicious. The eggplant parmesan sounds yummy to me! I’d love to try the 4 cheese lasagna! The shrimp scampi sounds yummy. We love Angelo’s family meals because they simply taste great compared to other frozen family meals one would see in the frozen aisle. The meat lasagna sounds yummy!! The Chicken Parmesan would be a family favorite! I shared this contest on my Facebook page – Melissa Britain Wilson. I would try any of the lasagna’s! The chicken parmesan is always a hit at my house. I want to try the veggie lasagne. I’m a subscriber and I liked you on facebook! Love the meals. Quick and easy and the kids love it!